The Burger Bar at Mandalay Place is fun. The place is mobbed, but the tables turn quickly. 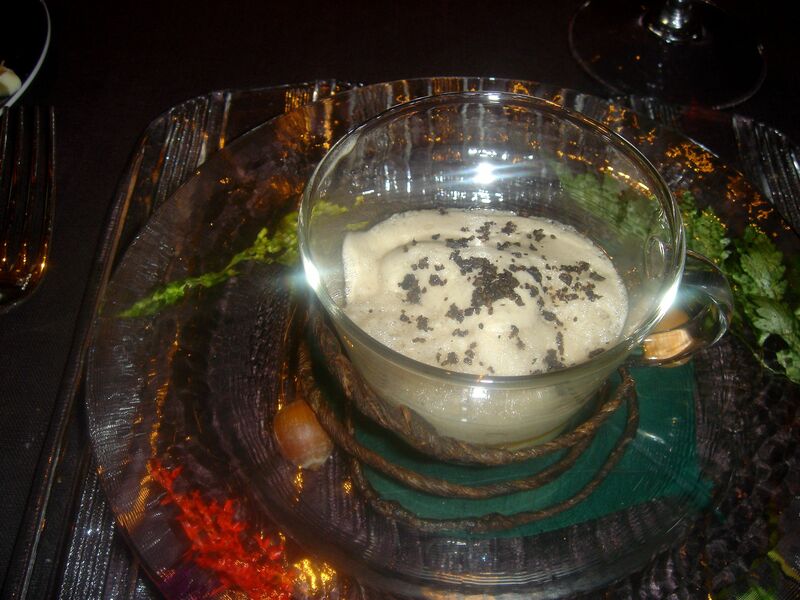 It is owned by Hubert Keller – Fleurs de Lys San Francisco and Las Vegas. Essentially you build your own burger – choosing what toppings you want from a huge list of options and what type of bread. We started with an order of onion rings with 2 sauces – one barbecue and the other more or less a take on ranch dressing. My husband had the Black Angus Beef with Cheddar, Bacon and a Fried Egg on a Ciabatta Roll. I had the Snake River American Kobe with Oyster Mushrooms, Caramelized Onions, and Cheddar on a Ciabatta Roll. There was too much roll vis a vis the beef and we both ended up eating the burger as an open-faced sandwich. Sweet Potato Fries rounded out the meal. A fun place with tasty food. 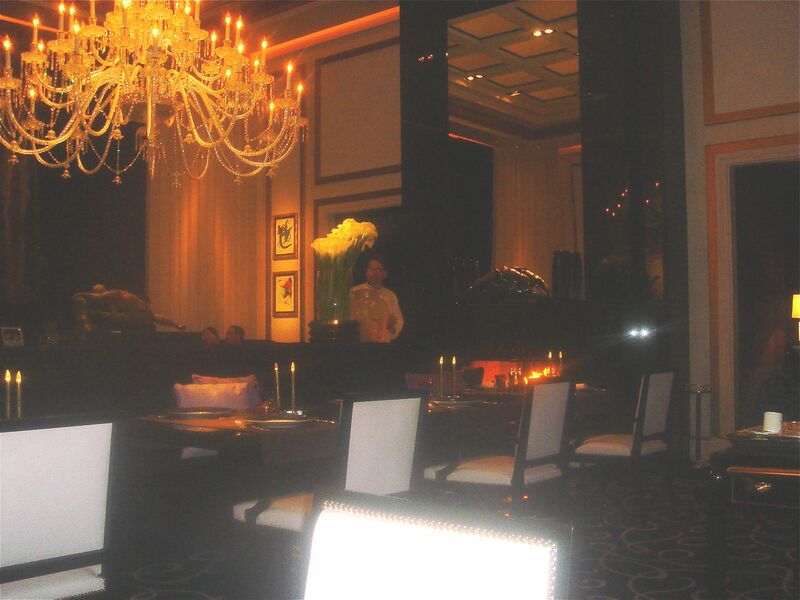 Alex located in the Wynn is named for its executive chef Alessandro (Alex) Stratta. The Wynn is over-the-top gorgeous. Every high-end shop is there – Chanel, Cartier, Dior, Gaultier, Louis Vitton, Graff, Judith Leiber — you get the picture. 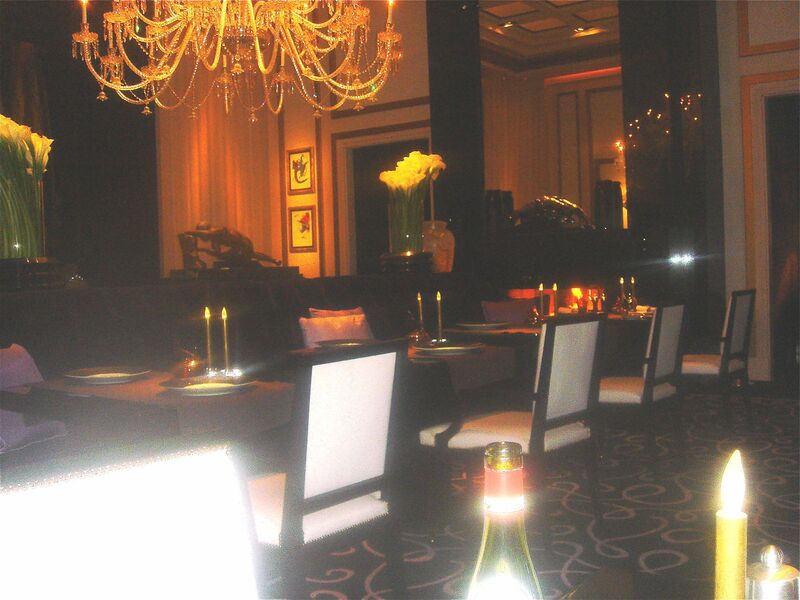 The restaurant is located in a quiet corridor far from the casino. Steve Wynn has spent a fortune on the décor. 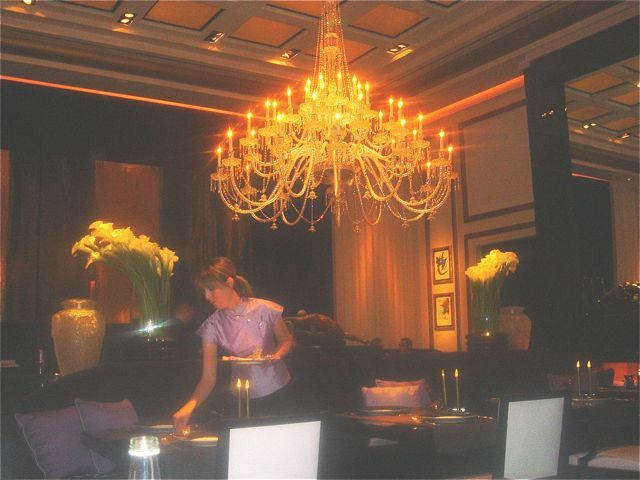 It is an opulent room that shouts grandeur. There is a dress code – jackets for the men and I saw the hostess refuse to seat 2 Hawaiian shirt types. But this is still Vegas; one couple must have just left the wedding chapel as she was dining in her wedding gown. You make an entrance when you dine at Alex – there’s a grand curved staircase a la Hello Dolly that descends to the dining room — huge windows looking onto real greenery, massive drapes, a predominantly orange color scheme. Our table was a large round by the windows. 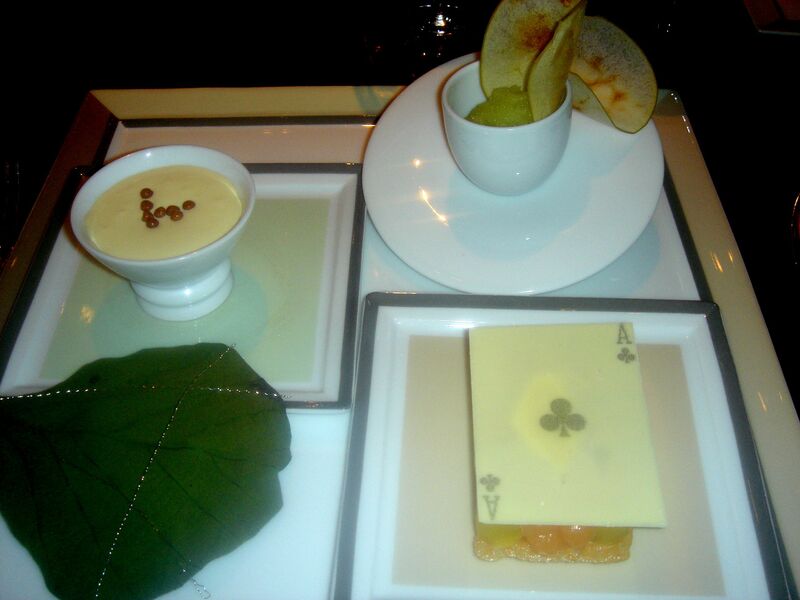 We decided to compose our own tasting and asked for each course to be one for two. 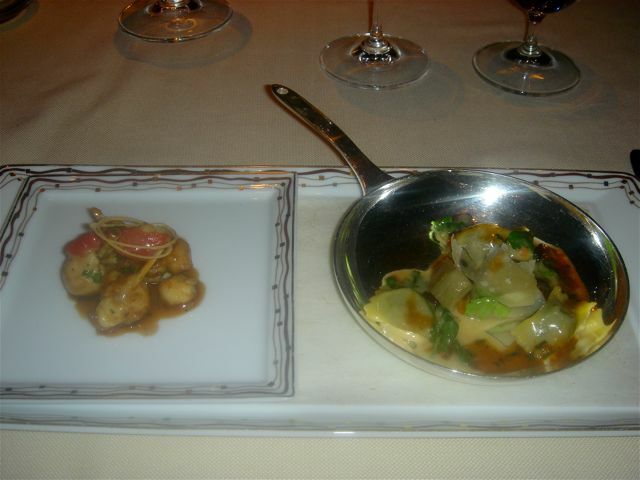 As you can see from the pictures, portion size is more than generous as each dish was a split. We were charged $120 each for this tasting. 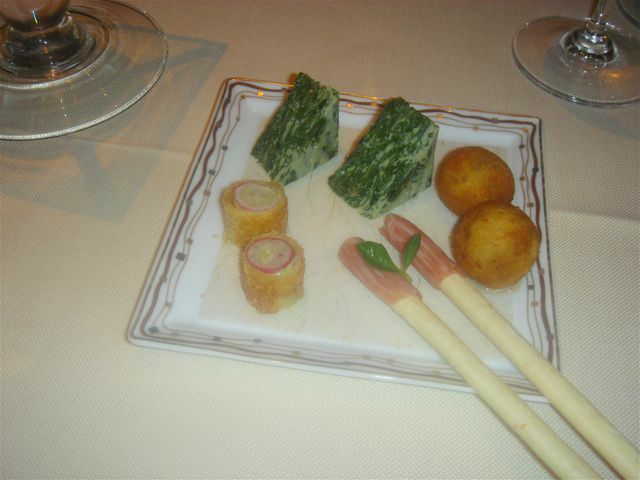 The chicken roulade and the arancini were the standouts in this amuse. 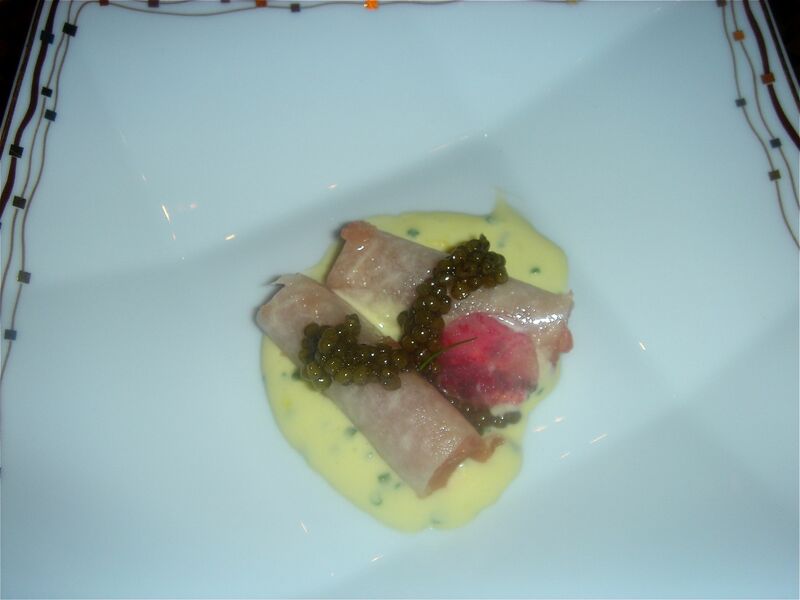 Chilled Toro Tuna with Jicama, Citrus-Chive Sabayon and Golden Osetra Caviar – absolutely superb – the toro was top quality. 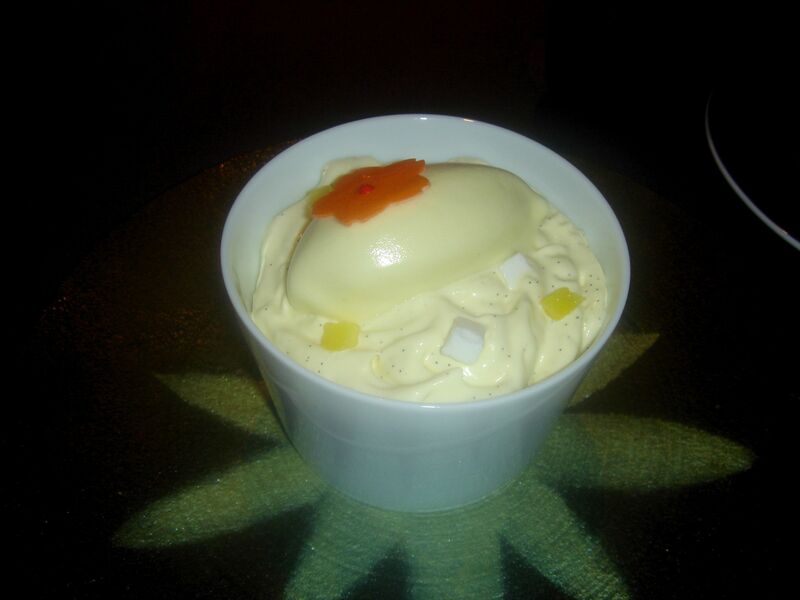 The saltiness of the caviar and the citrus-based sabayon was a wonderful foil for the toro. 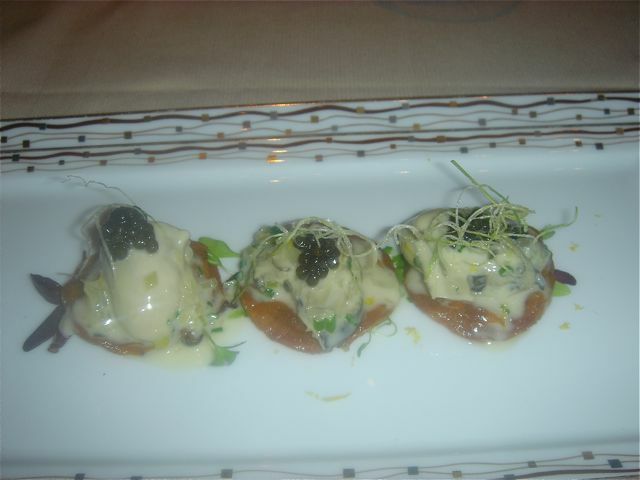 Kumamoto Oysters with Creamed Leeks, Crisp Potatoes and Oscetra Caviar – 3 bites of pure pleasure – the potatoes were indeed crisp and the oysters plump and briny. A sweet shallot compote rounded out the dish. Another winner – we were on a roll. “The chef calls his cuisine Mediterranean, though more accurately it is a mix of classic French and American ingenuity with Italian spirit.” I would label Stratta’s cuisine as just so satisfying – no bells and whistles, no foams, no intellectual exercise, just full of soul. Ricotta Gnocchi with Spinach, Chanterelles and Parmigiano Reggiano. 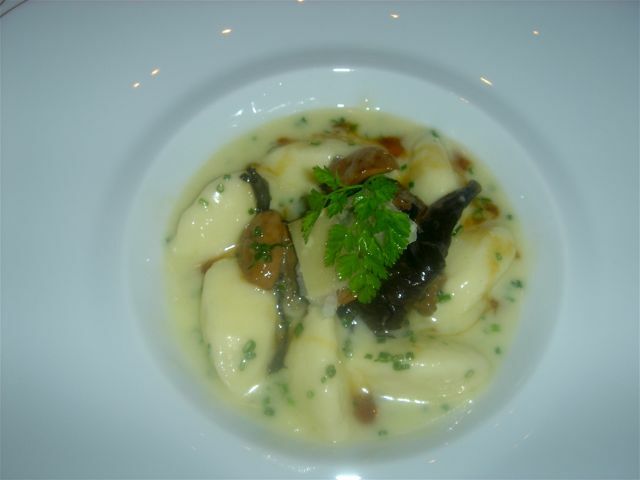 These were gnocchi to die for – light as air as they literally melted in your mouth. 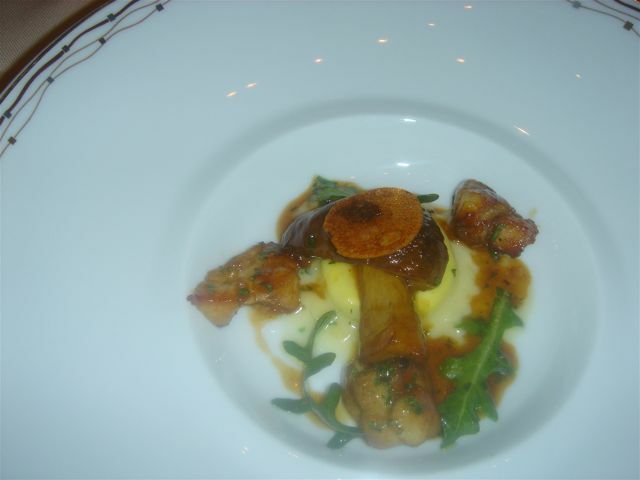 The sweetbreads were crispy on the outside, but still tender and moist. The ravioli were again a testament to Stratta’s excellence with pasta. 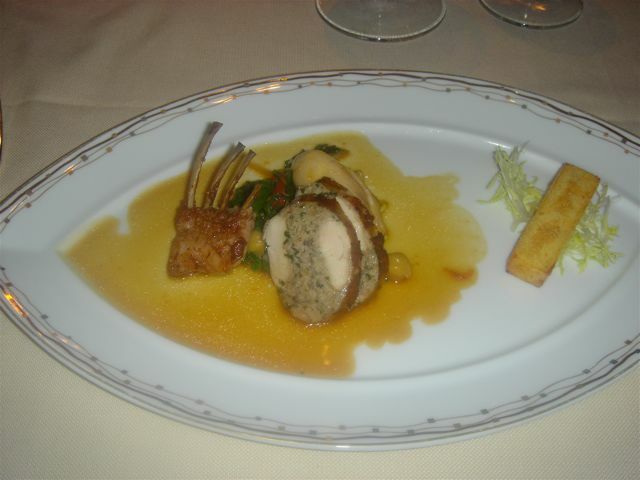 Fricasse of Rabbit with Swiss Chard, Preserved Lemon and Chickpea Fritter – another superb dish. 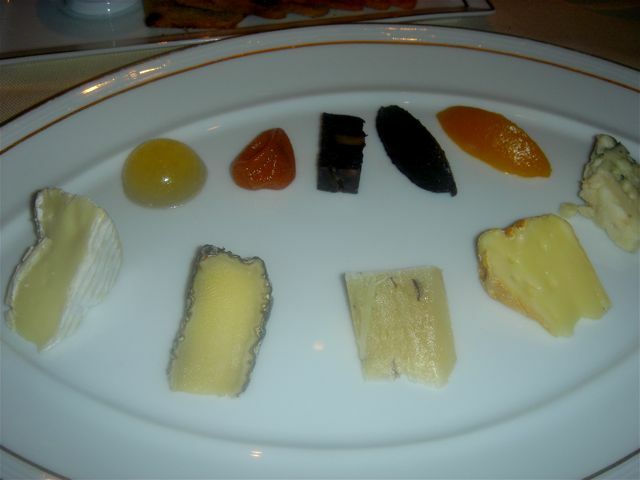 Cheese Plate – I didn’t write down the cheeses but they were served at the correct temperature and were properly aged. 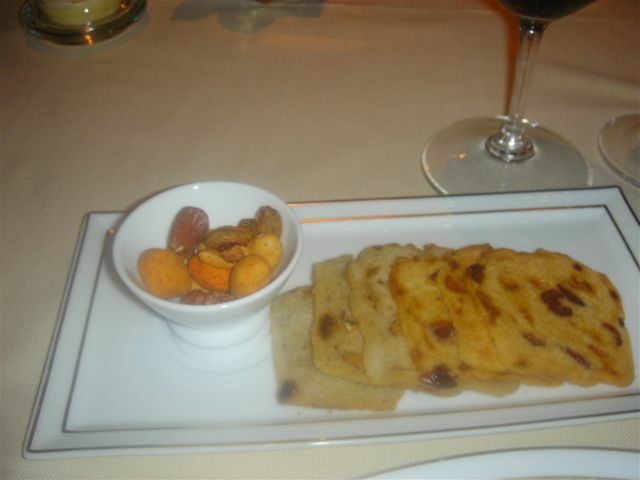 The side plate of roasted nuts and bread was equally good. 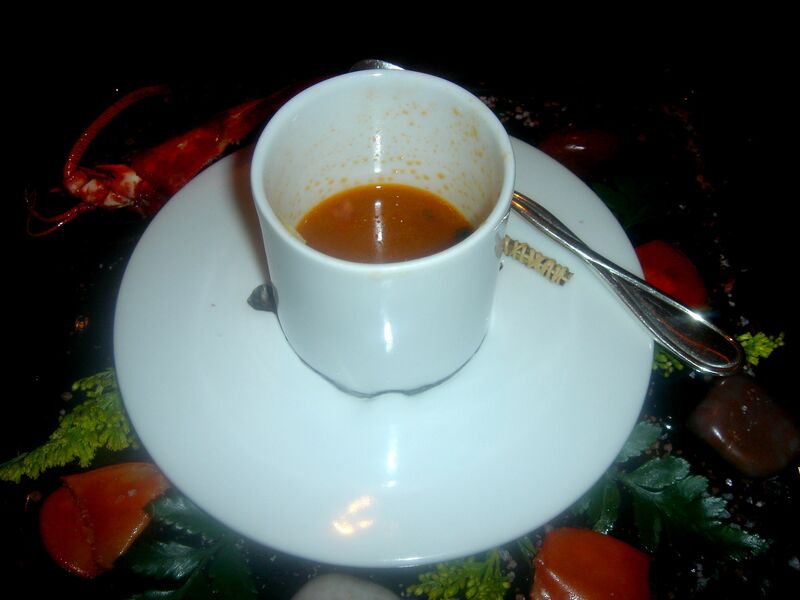 The service was smooth and professional so that dining here was a distinct pleasure. 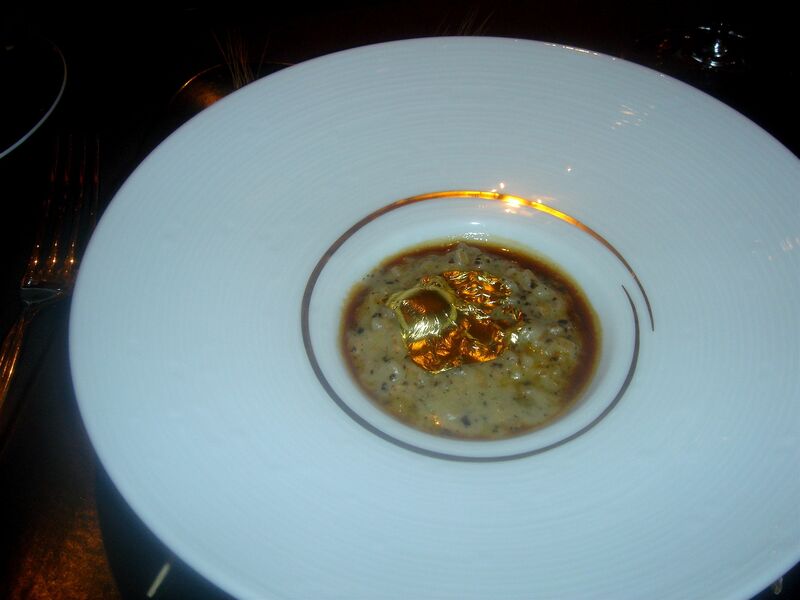 John remarked that this was one of the best first-time at a restaurant experiences we have had in years. Evelyn is absolutely correct that Chef Stratta “stays close to home and is in the kitchen 90% of the time” He did indeed cruise the dining room and genuinely wanted to know our “take” on Alex. Alex is definitely a must for anyone visiting Vegas – it is just so satisfying on every level.